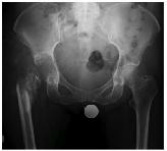 Despite sophisticated prevention strategies infection rates of around 1% persist in elective joint arthroplasty and much higher rates following fixation for trauma. Biomaterials and other foreign materials are inanimate and are thus susceptible to bacterial colonisation. After implantation implants are coated by the body with a layer of protein and platelets. If bacteria reach the implant prior to this coating by the host’s cells, bacterial adhesion may progresses to aggregation. In so doing these colonizing microorganisms develop and slowly grow in a structure known as a biofilm. Existence within this bioﬁlm represents a survival mechanism by which microbes resist external and internal environmental factors, such as antimicrobial agents and the host’s immune system. When was the joint replacement carried out? Were there any post-operative problems? Antibiotic treatment post-op? Wound healing issues? Ongoing pain and swelling? Risk factors for infection – diabetes, immunosuppressed, drugs, elderly. Can they cope at home? Is the wound discharging, how much? What does it look like? Who is dressing it? Have they seen the GP? Any antibiotics started? Depending on the patient, co-morbidities and timescale management can be on an in- or out-patient basis. Admit if uncertain and discuss with the team at a later date. Joint aspiration does not need to be done urgently. Usually this can be reserved until availability of aspiration in an operating theatre to guarentee sterile conditions.